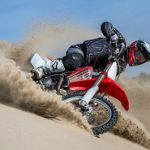 One of your regular maintenance jobs should be to check your fork seals for leaks, especially after you’ve been riding in dusty or sandy conditions. Knowing how to clean leaky fork seals may save you the unnecessary expense of replacing seals. 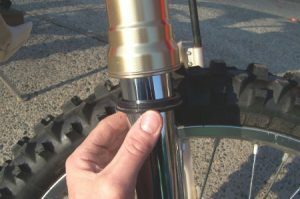 Your bike’s fork seals are made up of two seals, the Oil Seal, and the Dust Seal. 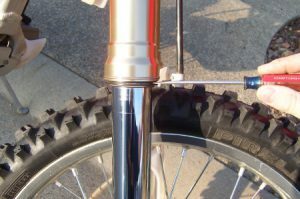 The Oil seal obviously seals the oil in the fork leg. The Dust seal keeps the majority of dust and dirt away from the oil seal. A telltale sign is usually a few drops of oil on the floor beneath the forks. If you notice the lower fork leg has oil running down the tube, the first step should be to clean under the seals as described below, before you go to the expense of replacing the seals. It may just be a grain of sand or some dirt that has got lodged under the seal and is allowing the oil to leak past. 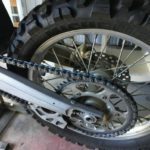 If you haven’t replaced fork seals before, it’s best to take it to your local motorcycle mechanic to do it for you. It’s not something you should attempt if you are not sure how to go about it. Both fork seals should be replaced at the same time, even if only one side is leaking. 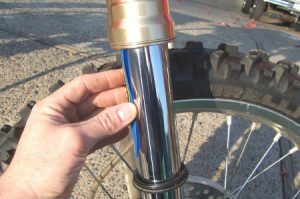 If you suspect a lot of oil has been lost, it is best to get the oil and seals replaced immediately, as it will seriously affect the performance of your forks. General wear and tear. You’ll generally get a couple of years out of the seals depending on the conditions you ride in. Small dents and scratches on the inner tube can damage the oil seal as it slides over them. If you’re lucky you can fix the problem by polishing off the scratch or nick with a piece of very fine wet & dry sandpaper. Dirt or sand caught inside the seal. If this is the case it can be removed by following the steps below. 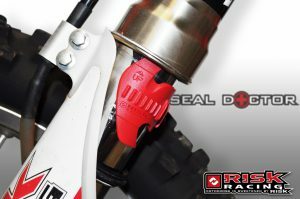 You will first have to remove the lower fork guards to get easier access to the seals. Use a clean rag to wipe any dirt and oil from the lower fork legs. Use a flat blade screwdriver to carefully separate the dust seal from the upper fork tube, taking care not to damage the seal or upper tube. Wipe any dirt and oil from the dust seal and slide it down the tube. Wrap a rag around the tip of the flat blade screwdriver and clean the entire area around the oil seal inside the upper tube. Now you can insert the thin piece of plastic film, or use the Seal Mate tool as shown in this picture. Insert the end with the hook first about 1/2″ under the seal. Rotate it around the tube and oil seal a few times, making sure that the hook end is leading. Continue rotating as you remove the tool. 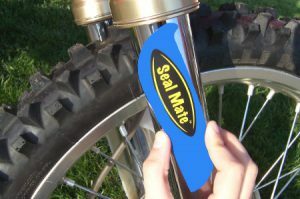 Remove the Seal Mate and wipe off any dirt that may be on it. Compress the forks 5 or 6 times and wipe off any oil that is on the lower fork tube. You may need to repeat the process 10-12 times until there is no oil left leaking onto the tube. That means your fork seals are clean. Clean the dust seal in the same manner and reinstall the seal with your fingers back to its original position. If the forks continue to leak that means the Oil Seal is damaged and will have to be replaced. I purchased the Motion Pro Seal Mate from my local KTM dealership for $12.95, but I have sourced it on Amazon for about $9. It’s a cheap solution to fork seal cleaning. 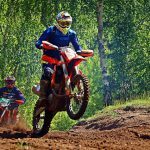 There is another tool I can recommend from personal experience, the Risk Racing Seal Doctor which is about $25 if you are happy to spend a bit more. I first came across this tool on a trail ride. I had seriously leaking fork seals and was lent one by some riders we met in the campground. It’s a bit easier to use because it clamps around the lower tube and you simply rotate it to clean the seals. I have found them on Amazon and again it is cheaper than the local bike dealer. 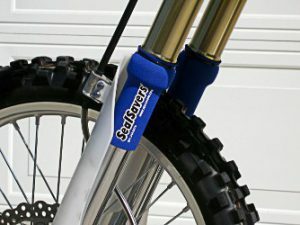 A good tip to help increase the life of your fork seals is to keep most of the dirt from even getting to the fork seals by using a pair of Seal Savers. 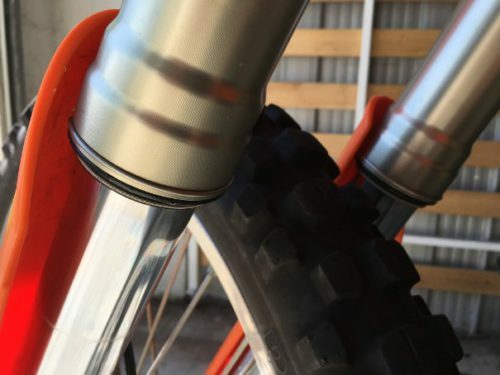 They are also available on Amazon for about $25, but be sure you get the right diameter for your bike. 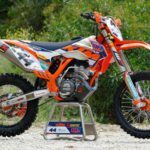 They are usually 1 1/2″ to 1 3/4″ for most USD forks. I hope this post has been helpful to you and may possibly save you the expense of an unnecessary fork seal replacement. Please feel free to leave any useful tips you may have in the comments below.